Born in Saint Petersburg, Russia in 1971, Alexander Vassiliev studied singing (with Prof. Yevgeny Nesterenko) and composition at the Tchaikovsky Conservatoire in Moscow, before joining the Opera Studio of the Bavarian State Opera in Munich. Thereafter, he was engaged at the opera houses of Freiburg, Braunschweig and Cologne, where he sang Bottom (A Midsummer Night’s Dream/Britten), Alidoro and Don Basilio (Rossini), Mephisto (Gounod), The Waterspirit (Rusalka/Dvorak), Kaspar (Der Freischutz), Figaro and Leporello (Mozart), Ramfis and Camillo (German premiere of Boesmans’ „Wintermarchen“). Vassiliev’s career would lead him to debut at La Scala in Milan (Der Einarmige/„Die Frau ohne Schatten“), the Royal Opera House in London (Pan Golova/„Tsarina’s Slippers“/Tchaikovsky), Teatro Colon in Buenos Aires (Le Bailli/„Werther“), Opera National de Paris and Teatro Real de Madrid (Priest/„Lady Macbeth of Mtsensk“). 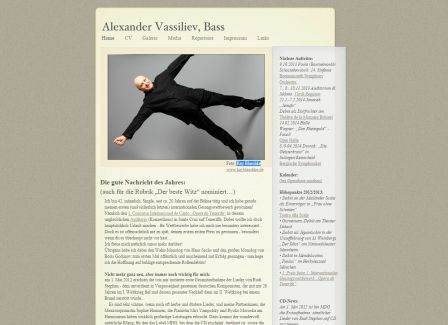 In previous seasons Alexander Vassiliev had been engaged at a number of opera houses including the Theatre de La Monnaie in Brussels (Rachmaninoff Troika, Old Gypsy/Aleko), De Nationale Opera in Amsterdam (Priest/The Cunning Little Vixen, Priest/Lady Macbeth of Mtsensk, Farfarello/Love for the Three Oranges) and at the Grand Theatre de Geneve (Bartolo/Le Nozze di Figaro, Colline, Biterolf, Forester/The Cunning Little Vixen). He had also performed at the Mariinsky-Theatre in Saint Petersburg (Figaro/Mozart), at the Munich Opera Festival, in Dusseldorf, Paris, Nancy, Montpellier, Cagliari and Bologna. More recently he made his debut as Gurnemanz at the Lübeck Theatre, sang Fasolt in Das Rheingold at the opera house in Halle, Germany, and Rychtar in Jenufa in Brussels. In September 2013 he won the 1st Prize at the 1st International Singing Competition Ópera de Tenerife. Other recent engagements include Cherevichki (The Slippers) in Cagliari, and in Brussels The Demon (The Servant) by Anton Rubinstein and The Golden Cockerel (Polkan) by Rimsky-Korsakov. In Amsterdam he was engaged to sing Der Notar in Der Rosenkavalier and 5th Jew in Salome, whilst at the Glyndebourne Festival the role of Badger/Parson in The Cunning Little Vixen and debuts as Gremin in Eugene Onegin and Commendatore in Don Giovanni. His current and future projects include the new production of From the House of the Dead (Prison Governor) by Krzysztof Warlikowski at La Monnaie in Brussels, the Opera National de Lyon and at the Royal Opera House in London. He will sing Skomoroch and 3rd Shipman in Rimsky-Korsakov‘s The Tale of the Tsar Saltan staged by Dmitri Tcherniakov also at La Monnaie, Bruckner‘s Te Deum under Hartmut Haenchen at the Palais des Beaux-Arts in Brussels as well as recitals in Freiburg and Staufen. He is also due to cover Golaud in Pelleas et Melisande at the Glyndebourne Festival Opera. 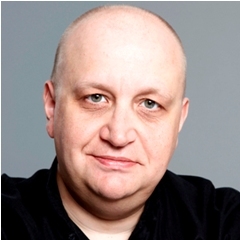 Alexander Vassiliev has worked with some notable stage directors (Pierre Audi, Laurent Pelly, Robert Carsen and Richard Jones) and with such renowned conductors as Kazushi Ono, Mariss Jansons, Armin Jordan, Daniele Gatt and Mikhail Yurovski. He is much in demand for concert work, having performed Verdi’s and Mozart’s Requiems, Bach’s St. Matthew’s Passion, Janáček‘s Glagolitic Mass and Shostakovich’s 14th Symphony, in venues such as the Concertgebouw in Amsterdam and the Palau de la Musica in Barcelona, at the Beethoven Festival in Krakow and at the Verbier Festival, and in many other important concert halls in Germany, France, Italy and Holland. His recitals have been presented in Geneva, Amsterdam, Elmau Castle, Citta di Castello, at Gidon Kremer’s Chamber Music Festival in Lockenhaus and in Davos. He has appeared with artists such as Helmut Rilling, Enoch zu Guttenberg and Christoph Spering. His singing has featured in many recordings, including the CDs of Bizet’s Ivan IV (Naïve) and Reznicek’s Tragical Story (on CPO), as well as the first complete recording of songs by Rudi Stephan (on MDG), a project started by the singer himself. In 2008, he co-founded and is now artistic director of the chamber music festival Klassikfest Kaiserstuhl in Ihringen.